So, like others before me, I created a #30before30 list not too long time ago. The list can be found on my old blog – but I’d rather not re-publish it here now because there are some things in the list that I want to change (hahaha can I actually do that though? I think I can! After all it’s my list :D). Anyway, one of the things in the original list was to visit Pekan Raya Jakarta or Jakarta Fair. It’s Jakarta’s biggest annual fair which first started back in 1968. Why did I put it on my list? Simple, I have been living for almost 25 years in the city but I never actually been. And since there might be a possibility for me not to live in this city anymore in the future.. I want to visit the fair before I’m 30 (Or, if leaving the city come sooner – before I leave this city for good). So I went there last Saturday with my mum and little brother. Before I actually went there, I imagine the fair would have a lot of stalls and booths – food and snack stalls, game booths, even some mini rides like the ones in American boardwalks. I was really excited to go. But then when I got there.. turns out that there are more sponsorship and trade booths rather than the ones I mentioned before. It is indeed an exhibition fair, with many big brands’ booths selling everything from potato chips to mop, even car! There is also a retail section where you can find discounted items of your favorite brands.. and when I say discounted, I mean BIG discount! I even scored a pretty Marks & Spencer top for only Rp.150.000 which is almost impossible to be found in their stores. Yay! While food stalls are not a problem (you can find many of them), only few I found selling traditional snacks.. and I couldn’t find rides for adults (SAD!). I found some rides like merry-go-round and boom boom car, but both in small version so it’s only suitable for kids. 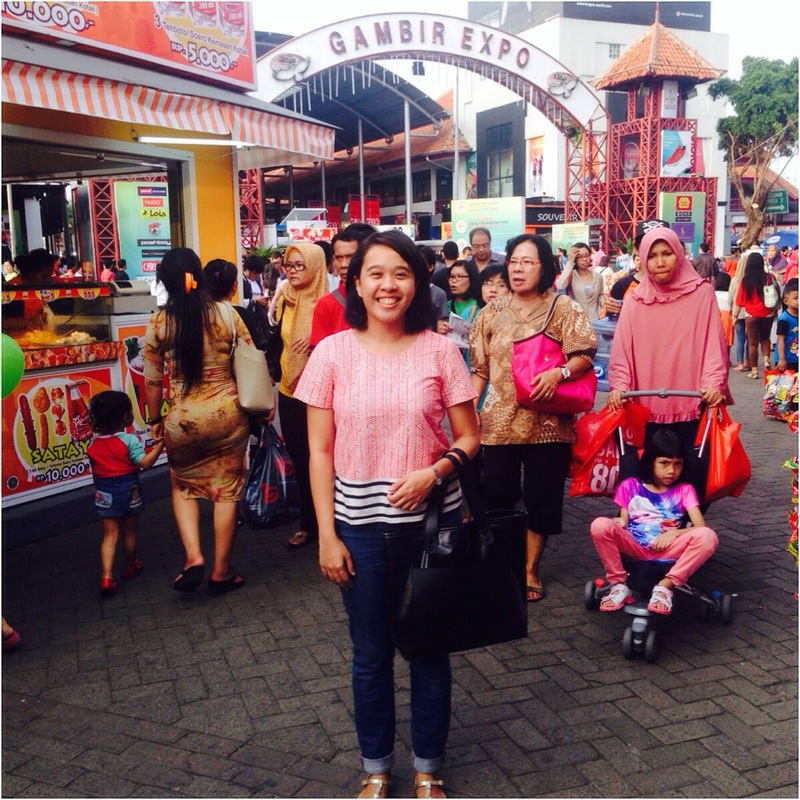 Well.. although the reality is not really like what I imagined, I pretty much enjoyed my first time going to Jakarta Fair. That’s another off my #30before30 list! Yay! On Sunday, me and my friends went to Thamrin City – a big shopping mall full of wholesale kiosks selling everything – mostly clothes.. cheap good ones. The three of us came there with a mission – that is to find kaftan to be worn on Hari Raya day! Hehehe. It did not take long for me to find a nice coral kaftan priced only Rp.85.000 (Oh! Have I told you that my favorite color is coral? ), and neither did my friends – we managed to spend only 2 hours shopping there. 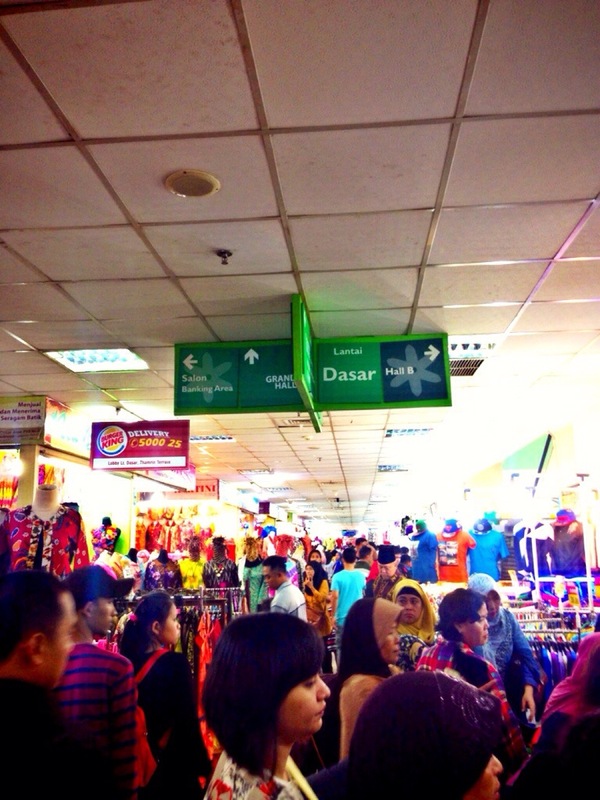 I consider that as an achievement, because Thamrin City was so packed that day! People (mostly mums) were shopping like crazy; almost everyone was seen carrying (minimum) a big shopping bag full of clothes. Just look at this picture! it was a shopping madness! So next time I want to find cheap kaftans or similar clothes, I think I would avoid going to Thamrin City during Ramadan month. Too crowded! Moving on.. after going to Thamrin City, I went home for a quick shower then went to my friend’s house for buka puasa . There were 9 of us, my college friends. Food was awesome – my friend’s husband cooked it for us. He made roast chicken and some sort of Rösti, veryyy yummy. We spent the night eating, chatting and laughing.. and that concludes my awesome weekend. with Kerak Telur and other Betawian delicacies plus big promo packages from well-known food brands. Thanks for sharing Christa, this surely brings back memories. Waaaah, aku terakhir ke PRJ tahun 2008, lalu gak pernah menginjakkan kaki ke sana lagi sampai sekarang, jauuh dan macet hahahhaha…Beli ciki2 rentengan dan kerak telor is a must! Nah, sejak 2 tahun lalu aku menyiasati belanja keperluan lebaran sebulan sebelum Ramadan, Tanah Abang dan Thamrin CIty beda tipis sama pasar tumpah, rusuh dan penuh hahahaha..
Kamu weekendnya produktif sekali, aku beberapa weekend ini teleerrr hahahahahaha…. Next Next post: Hello Taipei!